A spectacular total of 651 Peregrine Falcons were tallied during the October 10, 2012 hawk count conducted by the Florida Keys Hawkwatch, at Curry Hammock State Park. To their knowledge, this is the highest number of individuals of that species counted in a single day, anywhere in the world! The previous high count of 638 Peregrines had been established also at Curry Hammock on October 11, 2008. Most of the migrating raptors we see at the Florida Keys Hawkwatch (FKH) entirely leave the continental U.S. soon after they have been tallied from Curry Hammock State Park. The Florida Keys arches southwestward into the Gulf of Mexico, making it an ideal launching point for migrants traveling into the Caribbean and Central America during the North American fall season. 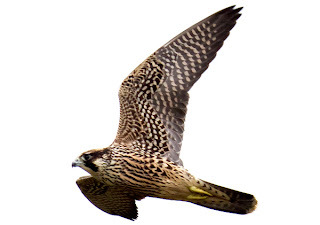 Satellite tracked Peregrine Falcons and Ospreys migrating over the Florida Keys have flown over Cuba and as far as Nicaragua within 24-hours or less.